Bentley has a rich history of designing vehicles that are the pinnacle of automotive luxury, and the KAHN edition 2018 Bentley Bentayga V8, available for sale from your friends at Hippo Prestige, takes that luxury to the next level by adding extra exclusivity to an already exclusive car. Let us take you on a tour of this unique prestige car. The Kahn Bentley Bentayga balances exquisite refinement with astonishing performance. Not forgetting the unmistakable sound of the Bentayga’s V8 engine that reverberates everything around it. An eight-cylinder 4.0-litre engine capable of a power output of 541-bhp powers the Bentayga and the car delivers a top speed of 180mph making this elegant car as imposing in its performance as it is in design. This 2018-model Bentayga has only 4354-miles on the clock, so it is a young car still, but that doesn’t mean it is meant to be hidden in a garage. This Bentayga V8 is a prestige car that wants to be driven and shown-off to the world. The Bentayga V8 comes with privacy glass as well as a full Panoramic glass sunroof with a front panel that can tilt and slide while the rear panel remains fixed. ‘Plush’ doesn’t come close to describing the experience this Bentayga offers drivers and passengers. The car offers Bentley’s Beluga interior with Piano Black interior trim, contrast stitching and embroidered Bentley emblems on the car’s seats. All these elements combine to give off an unquestionable luxury feel when you are seated in the car. With such unparalleled comfort available on a customised 2018 Bentley Bentayga, opting for a low mileage used model is excellent value for money, and showcases your excellent taste. Hippo Prestige regularly has Bentley models in stock, and we regularly sell these exquisite British luxury cars amongst other prestige and specialist cars in our showroom, so we are able to find the perfect car for you. 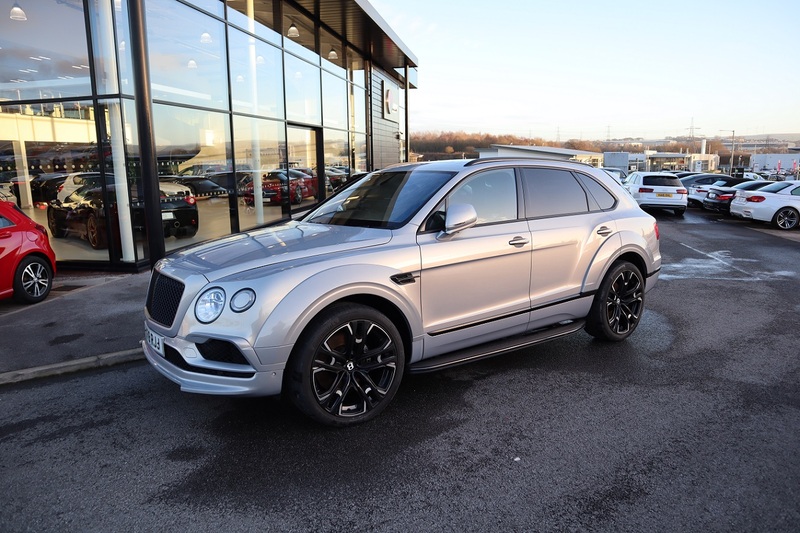 To see this one-of-a-kind Bentley Bentayga and get a quote, come view it at the Hippo Prestige showroom in Blackburn. To arrange a test drive of this or any of our other used prestige cars, call our account managers on 01254 916 450 today and the team will be happy to help you.